Z4 Tablet or Nexus 9? So I've tried the Nexus 9 and I've not had the best of experiences. I've had to change it 6 times due to the lack of build quality - each one has had something or other wrong with it. Broken speakers, vibrating motors or flush buttons were all part of the problem. Now I'm considering the Z4 Tab and I'm hoping, with it being a Sony product, it will be made with a lot of care and attention to make it a high quality product. I like the extra features Sony packs in on top of vanilla Lollipop but then I really like the way the 9 looks such as the front facing speakers. I had the same dilemma when choosing between the Nexus 9 and Z3 Tablet Compact. To make things more difficult Sony are doing the 32GB LTE version for the base price of £499 with the Bluetooth keyboard that was showed off at CES this year. did you consider Nexus 7? That's what I'm upgrading from. My 2013 7 is starting to struggle both in terms of hardware and software it lags and the performance is becoming choppy as time goes by. It takes a while for it to realise apps have been minimised. The hardware problem is that it requires the charger to be held in a certain position for it to charge. I still use my N7 2013 at work for a GPS and email but yes it's fairly slow now and the size was never good for Web browsing for me. I posted a little on the Z2 tablet and I really like it, performs great and I chose to hold it back on 4.4.4 because that's mature and quick. I also got rid of my Nexus 9, love the hardware but the software is broken. Maybe you could try a Z2 tablet for a while, you might end up keeping it. Try a qi charger for your nexus 7. Charges about 20% an hour but is super convenient. I hadn't thought about that thanks for reminding me! I'm pretty excited to get a look at the Z4 tab. I've been thinking about getting back into a large tablet for a little while now. There's so little size difference between my Nexus 7 and Nexus 6 that the 7 is just getting dusty these days. Seems to be so few good 'flagship' type 10" Android tablets nowadays, as apposed to a few years ago, so I hope this Sony is as good as it looks. If I remember right the wait is drawing to an end. A big tablet is actually one place where I want the fastest processor available so I look forward to the Z4. 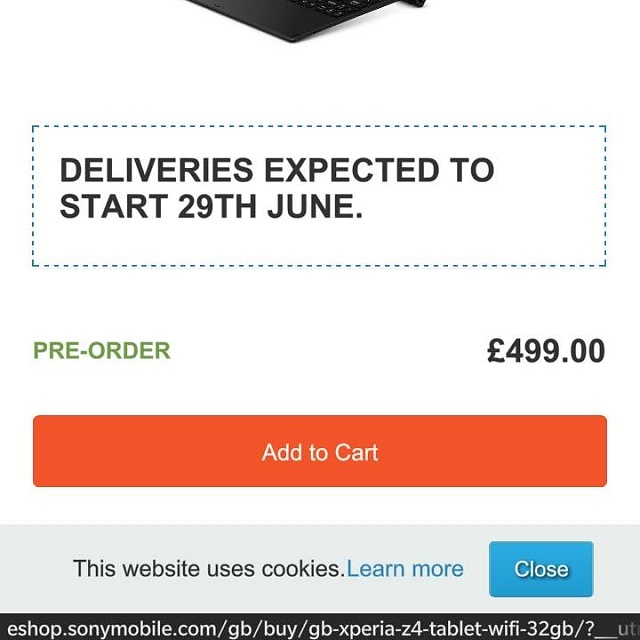 It was supposed to launch on the 27th May (tomorrow) here in the UK but it seems we can't place any orders through the Xperia online store. Not for the Wi-Fi only model, anyway - only the cellular one. And that's not out until the 5th June apparently. So maybe we'll have to wait a while longer. It's been delayed until the end of June! Anyone know the length of the leather bands? Or how it compares to the metal band? haw to manage photos in folders on nexus 7 w/android 5.1? Why does my Galaxy 3 Tablet prevent Emails Being Sent?